Folding arm awnings are ideal as a roll away cover for a patio, deck, balcony or commercial applications such as restaurants. 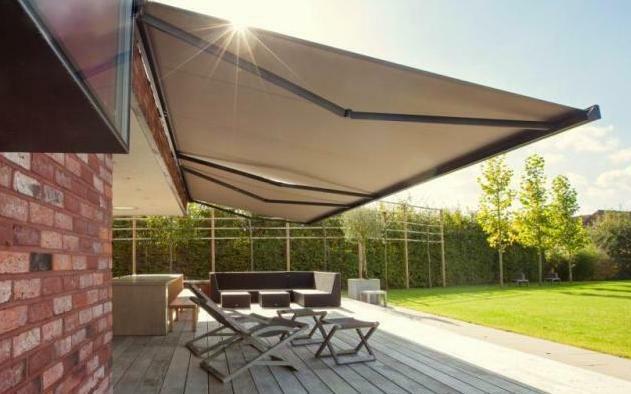 With a folding arm awning you can create an outdoor room that protects against the sun or light rain. 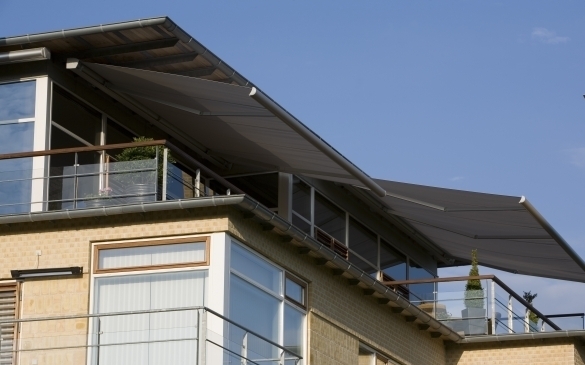 In folding arm awnings the arms fold horizontally instead of vertically as in other awnings. Folding Arm Awnings need no posts or vertical supports and therefore the area can remain clear and unobstructed with no intrusive posts. When the awning is retracted the space is free of any structure. 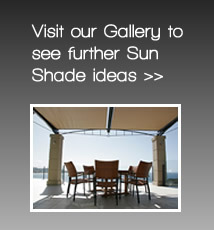 Ozsun offers a large range of folding arm awnings. 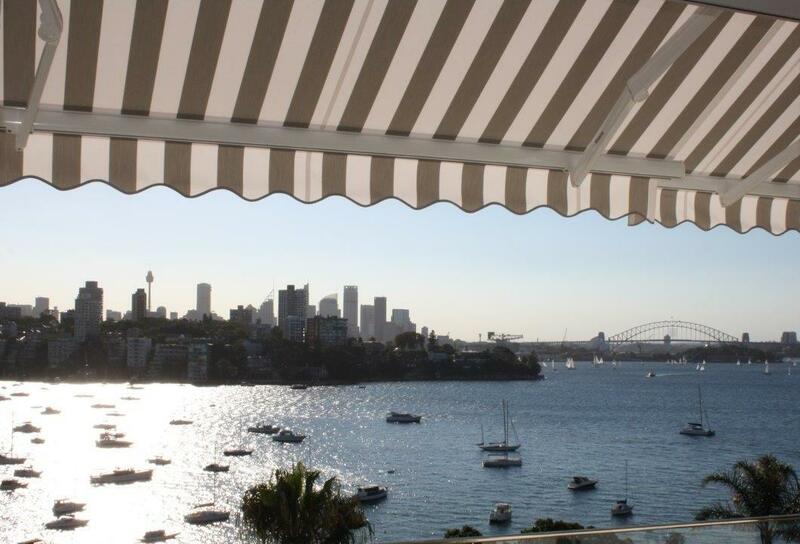 We are based in Sydney but the awnings can be shipped anywhere in Australia. Ozsun’s premium Helioshade range of retractable folding arm awnings are the only folding arm awnings engineered to withstand winds of up to category six (48km/hr) on the Beaufort wind scale. The Helioshade folding arms are made in Austria and incorporate four cables in each arm for superior performance. Our Sunmark range of folding arm awnings includes three full cassette models and three Monobloc open/semi cassette models. Our German designed folding arm awnings are engineered for durability in the harsh Australian climate and are designed to withstand winds of up to category five (38km/hr) on the Beaufort wind scale. For added convenience, the awnings can be motorised using a remote control, and can be fully automated by innovative sun and wind sensors. Choose from over 100 colours and patterns from our extensive range of long lasting water and UV resistant European made fabrics – designed to compliment any external façade and installation. Folding arm awnings can be mounted onto the face of a building. On a brick wall seven courses of bricks are necessary above the awning. With the addition of fascia or eave brackets a folding arm awning can be installed from the rafters of the roof where there are insufficient courses of bricks in the wall to support the awning. The fascia brackets are installed by cutting a slot in the fascia just below the gutter. The bracket is pushed in through the slot and bolted to the adjacent rafter. The folding arm awning is then attached to these brackets. This effectively ‘ties’ the folding arm awning to the roof structure. 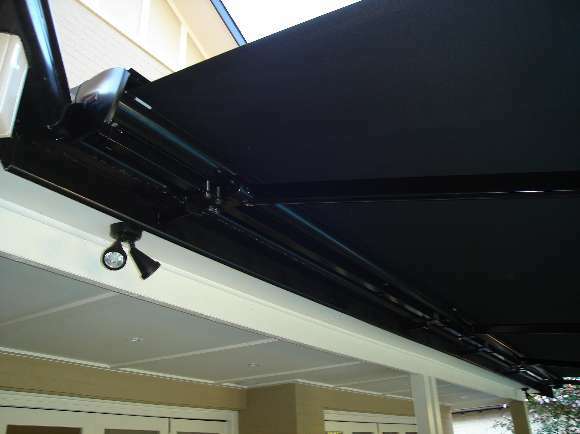 In addition to being a very secure way to fit the folding arm awning, it allows the awning to be mounted up high near the gutter. In the Sydney region we offer a complete installation service. Folding arm awning installed under an eave. Folding arm awning installed on fascia brackets. 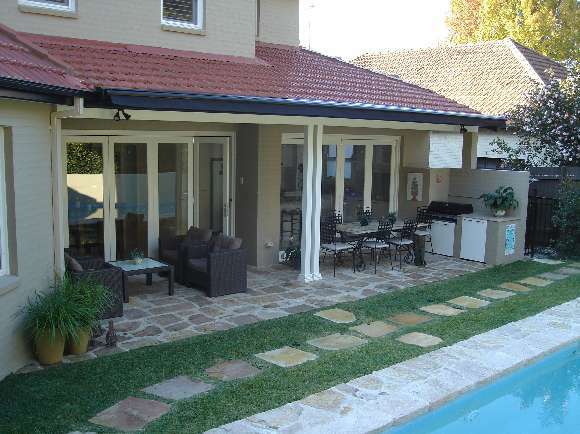 Berlina Folding Arm Awning installed on fascia brackets – Sydney. Note how it fits in front of the gutter. 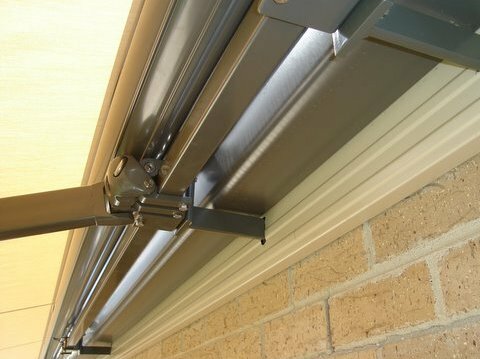 The same Berlina Folding Arm Awning retracted – neatly aligned with the gutter and fascia. The maximum width of a folding arm awning is 25 metres and the maximum projection is 4.0 metres. The width of the awning must be 500mm wider than the arm projection to allow the arms to fold, with the exception of the unique Stratos 1 oversquare folding arm awning. A folding arm awning can be operated either by crank handle or electric motor but electric motors are recommended where the awning has more than two arms (greater than 6 metres in width). The tubular awning motor is concealed within the tube that the fabric rolls onto. 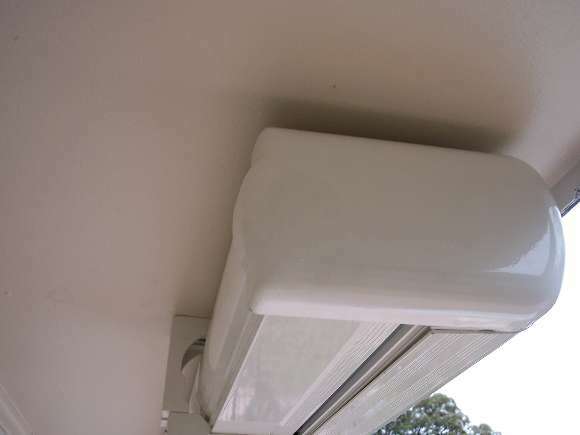 When motorised the awning is operated with a remote control which can be hand held or wall mounted. A folding arm awning should be rolled away whenever the wind seems to be moving the awning too much and it should never be left extended whilst the house is unattended. An automatic wind sensor can provide a degree of protection. It will roll the awning away when the wind exceeds a preset level. While the wind sensor provides protection in most conditions, a sudden extreme gust of wind could damage an awning before it can retract. This is particularly the case for an awning with a large projection or drop which takes some time to retract. The slope (pitch) of the folding arm awning can be adjusted with an allen key. Customer adjustable pitch control via a crank handle is available as an extra option on the Helio Classic folding arm awning and the Neo folding arm awning. If sufficient slope can be obtained, a folding arm awning will withstand light showers but it should be considered as a sunscreen rather than as a retractable roof due to wind restrictions. Ideally the awning requires a minimum pitch of 15 degrees to ensure that rain water will not pool on the fabric. We have gained a great deal of experience installing folding arm awnings in Sydney for over 20 years in both domestic and commercial applications. Folding arm awnings are our main business, although we also offer a range of other awning types – if you go to the awnings page you can see some of the other styles of awnings listed. If you live in Sydney we offer a free home consultation to assess whether a folding arm awning or another type of awning is going to best suit your requirements and budget.